Do you know what it feels like to see a living legend walk into the room? That is how it feels to get a new Mama video game. She is a Family Friendly Gaming Hall of Famer. So I take notice when an icon gets a new video game. Mama is back in all her glory in Gardening Mama 2 Forest Friends. I am happy to see Mama come back in any, way, shape or form. I am eager for a sequel to Crafting Mama one of these days. 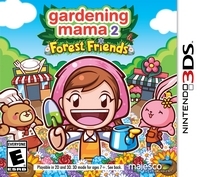 Gardening Mama 2 Forest Friends is a fantastic game that encourages families to grow flowers, fruit, and vegetables. I have to quibble with Gardening Mama 2 Forest Friends on one thing. I see strawberries as a fruit, not a vegetable. I have also heard tomatoes are a fruit not a vegetable as well. But I am not interested in arguing that point. The strawberries are a fruit to me. I know there is debate on the topic, but it is not a vegetable. After going through the tutorial there are a variety of things we do in Gardening Mama 2 Forest Friends. We can read our mail in the mail box. This opens up new mini games, and new items to plant. We can plant, water, pull up, and pick things in our gardening area. We can go to the shops and give them items. They will ask for things on a daily basis. There are tickets we earn in Gardening Mama 2 Forest Friends for completing requests. We can add items to our gardening area, change fences, and more. This can be slow going at first, until harvest time. Which is different per item. An orange tree takes longer than say a daisy. Water in Gardening Mama 2 Forest Friends is pretty simple. Be careful not to over water - it will lower the value of the harvest of that particular plant. It is important to go to the house and get some sleep once it gets dark. Mama lets you know when it is time. There is a lottery in Gardening Mama 2 Forest Friends. This is where we can win items that can be placed in our gardens. I wish there was some more flexibility to where we put items. Like I wanted to put the slide in the grass, and not on the path. There is a very addictive quality to Gardening Mama 2 Forest Friends. The mini games change all the time. What we do in the mini games change. It kept me on my toes. I replayed many of them because I did not initially understand some of the nuances. There are numerous items in Gardening Mama 2 Forest Friends. I wish there was some more room to plant things. I kept getting new items, new request, and no space to put them. This is mainly because it can take so many days for certain things to grow. Also certain things like trees can only fit in specific areas. Gardening Mama 2 Forest Friends can teach the joys of farming. Our family has a little garden we plant every single year. We also grow strawberries and raspberries. We eat the fruits of our labor, and make things like jam out of some of them. It is great to see a video game supporting this kind of self sufficient behavior.